Soyuz are a relatively new microphone manufacturer, based in Russia but combining Russian microphone technology with Western aesthetics, QC and marketing philosophies — indeed, the word Soyuz actually means ‘union’. The company are based in Tula, located 120 miles south of Moscow; a city which, over more than four centuries, developed as a centre for a wide variety of metal–working crafts. An electronics factory established there in 1927 was credited with designing and manufacturing the country’s very first microphone, and that plant — still operating today — is the oldest continuously working microphone factory in Russia! 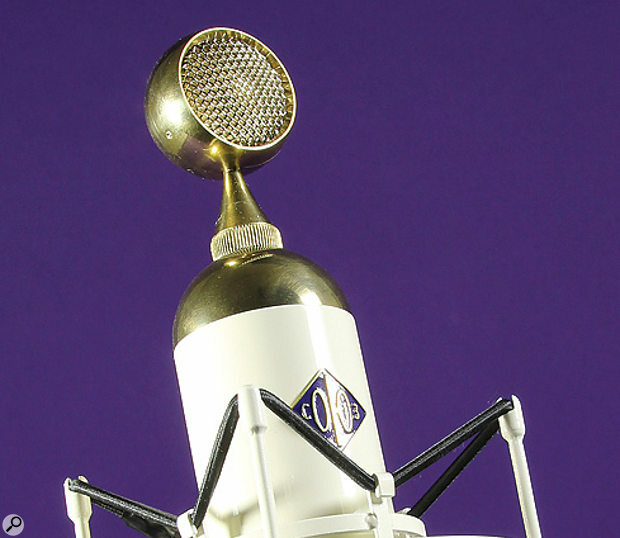 Currently offering just two microphone models, the Soyuz SU–011 is a small–diaphragm ‘pencil’ mic, while the SU–017 flagship model is a large–diaphragm ‘bottle’ mic. Both are entirely handmade, with the company machining, assembling and tuning their own capsules from the raw materials, winding their own transformers, and assembling the electronics in–house with point–to-point wiring. The SU–017 is offered as a ‘premium’ capacitor microphone, employing a valve impedance converter and a transformer–coupled output in a simple ‘low–parts–count’ circuit. Unusually, the large 34mm–diameter capsule head is detachable, and although the microphone is supplied with a cardioid capsule, it will apparently be usable with other capsules currently in development for future release, including large–diameter omnidirectional and fig–8 units, as well as the small–diaphragm capsules from the Soyuz SU–011 ‘pencil’ mic. It looks like the capsule section should unscrew at the top of the body, but I’m afraid I couldn’t persuade the review model to budge at all, and the handbook offers no information on swapping capsules other than to say they are swappable! Packaged within in a foam–lined cardboard box, the mic itself is safely ensconced inside a very nice hand–made and velvet–lined wooden case, while the mic’s bespoke power–supply unit, five metre connecting cable and cat’s cradle–style elastic shockmount are all housed in individual pockets within the foam lining. The lack of a decent carry case is rather disappointing, though, and I can’t think of another mic in this price bracket that I’ve reviewed that didn’t come with one. The shockmount is quite solidly made, but it has a 5/8–inch thread on the standmount and no 3/8–inch adaptor is supplied. There is a spare elastic loop, though, and a spare PSU fuse and, surprisingly, a spare valve are also included. A quality–control frequency response chart is packed in with the mic, along with the business cards of the individual technician who assembled the microphone (Olga for the review model), and the mic’s designer, Vladimir, who apparently tests each SU–017 microphone personally before it is shipped out. The valve employed by the SU–017 is a 6J1P type.The capsule head, as well as its internal frame and the top and bottom sections of the mic body, and are all machined from brass (apparently on lathes built in the Kalashnikov factory!). Since the brass is not treated or lacquered, owners will need to clean the casing periodically, but a polishing cloth is supplied for this purpose. The mic’s marketing material claims that the SU–017’s body is “a sphere, bisected and separated by a Golden Ratio” — and my ruler tells me that the centre sleeve is precisely 1.618 times longer than its diameter! Soyuz also state that the designers believe using shapes and ratios favoured by nature helps to reduce unpleasant resonance. Perhaps, but it is certainly an unusual and attractive thing to behold, the gold–coloured caps being inspired by the domes of Russian Orthodox churches and the Sputnik satellite, and the body cylinder by the Soyuz rocket. The actual measurements are 226mm in overall length, and 55mm in diameter, with a weight of 950g. The bottle section of the body measures about 135mm in length. I was expecting the central white–coloured body section to be made of brass as well, but in fact it is an aluminium cylinder, simply clamped between the semi–spherical brass end pieces. 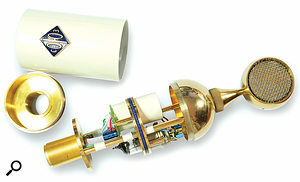 There are no locating pins or notches, meaning that if the lower brass dome loosens the body sleeve can rotate. It can also be replaced upside down and back to front, as I discovered the hard way! As shipped from the factory, though, the badge indicates the front of the cardioid pattern and — just in case the body sleeve does become misaligned — the polar pattern’s orientation is also engraved on the top of the capsule. Similarly, the microphone’s serial number is engraved on the inside of the bottom brass cap, so it’s only visible when the mic is disassembled. The PSU has the same attractive glossy cream finish as the mic itself.The impedance converter uses a Russian pentode valve in a triode circuit. The Cyrillic markings on the valve translate as 6J1P (6G1P), which is apparently equivalent to the 6AK5W, E95F, or 6096. Sourced from a Russian factory that has been making vacuum tubes since 1962, the valve is suspended upside down alongside a compact cylindrical transformer, both being supported from a brass plate mounted midway along the mic’s internal frame. The half–dozen passive circuit components are hand–soldered directly onto the base of the valve holder in a very old–school kind of way. Soyuz have based the SU–017 cardioid capsule design on the revered Neumann K67 capsule, which was first introduced for the U67 mic and subsequently employed in the U77, U87 and SM69 models. 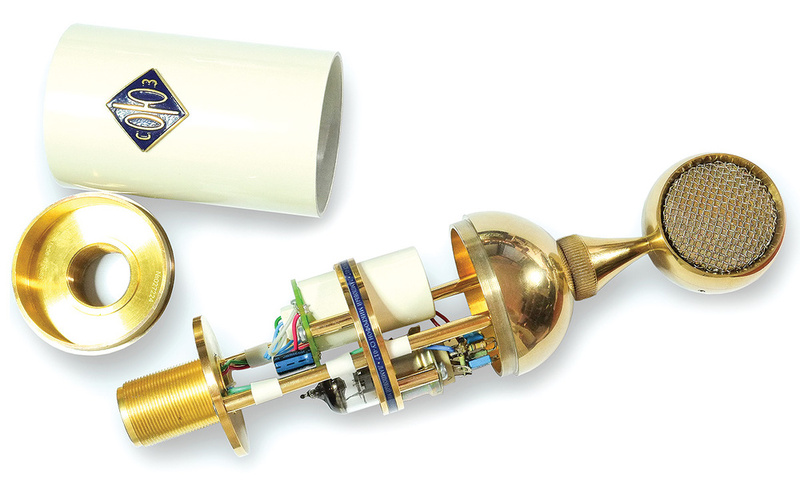 The nominally one–inch gold–sputtered and hand–tuned diaphragm is housed within a 34mm diameter capsule design, which shares the K67’s characteristic back–plate drilling pattern and dual–element construction. It is enclosed within a disc–shaped brass housing and protected by a dual–layer wire–mesh grille, the whole assembly being supported on a tapered column, which appears to screw onto the cylindrical preamp body. The mic’s sensitivity is given as a pretty standard 16mV/Pa, and self–noise is specified as 20.0dB(A), which is fairly typical for a valve mic, albeit one with a slightly higher–than–usual output impedance of 270Ω. The maximum SPL capability isn’t specified. 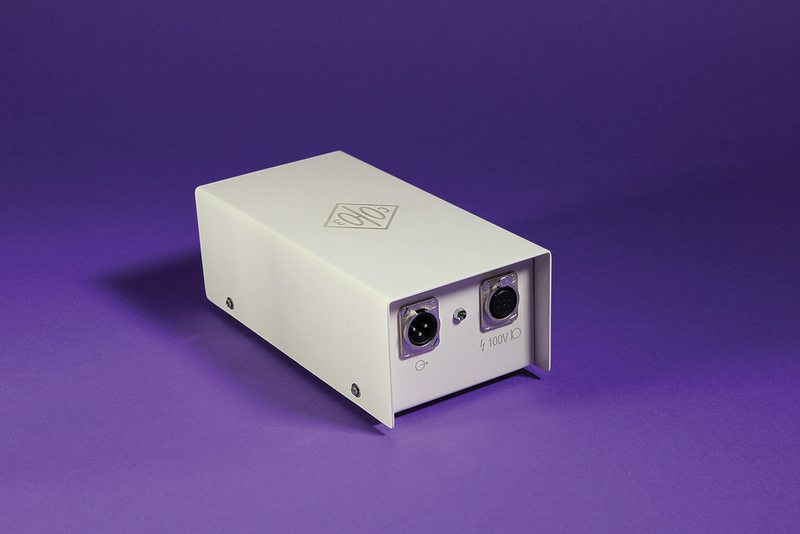 Each mic comes with its own frequency response reading.A dedicated power–supply unit is painted the same slightly off–white colour as the mic’s centre section, and carries the company logo on the lid. A label underneath carries the CE logo, states the fuse values, and carries the same serial number as the mic itself — as does a metal plate at the mains inlet end of the unit. Alongside the IEC socket is an illuminated mains switch and fuse holder, while the opposite end–plate carries a six–pin XLR for the mic’s connecting cable, a three–pin output XLR (both genuine Neutrik) and a green power LED. Internally, the unit houses a simple linear power supply with a small toroidal mains transformer. The panel is marked to suggest the valve’s anode voltage is around 100V. The valve doesn’t take long to reach its normal operating condition, and listening to the SU–017 I was treated to a pretty full and warm bottom end with a slightly rich character through the lower–mid-range. There’s a modest presence peak around 10kHz which gives a pleasant sense of airiness and detail that worked well on both male and female vocals, as well as on most instruments. This is a characterful microphone rather than a clinical neutral one, but it is a very attractive character for vocals and a range of solo instruments (it was particularly flattering on cello, for example). 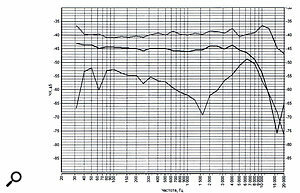 Proximity effect is quite pronounced when used close to the source, but the QC frequency plot indicates a fairly well–controlled response when used at a greater distance (maybe 30cm), where the output remains within about ±1dB between 40Hz and 3kHz. Above that frequency there’s a mild dip before the modest +4dB presence peak kicks in, and of course the HF tails off fairly rapidly above about 15kHz, as it does with most large–diaphragm mics. The front of the cardioid pattern is quite broad, with the response remaining fairly consistent over ±35 degrees, beyond which the high end (above 4kHz) drops off very steeply as the source moves off–axis. 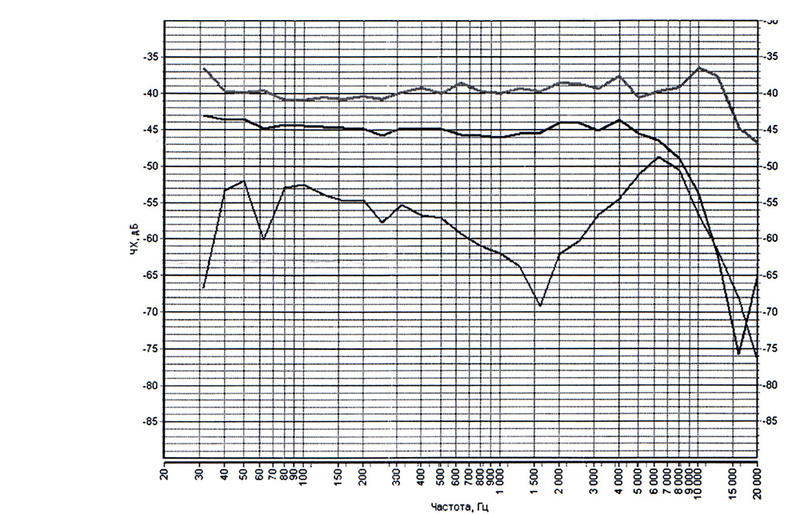 There is an obvious response ‘tail’ at the back of the microphone, and the polar response seems to be more hyper–cardioid overall than cardioid, but even so the rejection of rear–ward sounds is generally more than 15dB across most of the frequency range, and 25dB through the upper–mid-range. During my testing there were a couple of occasions where I thought the mic was approaching internal overload (there is no switchable capsule pad), but rather than clip nastily it seems to enter saturation with reasonably progressive distortion — and no doubt some will find that a beneficial feature. Overall, the Soyuz SU–017 looks fabulous and has a sound quality to match. By any standards, then, this is a really lovely microphone — although it does need to be, given how much it costs! It is constructed to a very good standard, and the craftsmanship is evident throughout. The ability to swap capsules in the future is an appealing feature, and the inclusion of a spare valve is a comforting touch given its rarity and exclusivity. Assuming a UK price of around £2750, tThe Soyuz SU–017 sits among impressive competition, including the likes of the Microtech Gefell UM92.1S (with its M7 capsule), Blue’s Cactus, and Brauner’s superb VM1 and VMX cardioids. The Flea 49 is also priced comparably, and is based on the Neumann U49, which the U67 was designed to replace... and then there are the modern versions, the M149 and U47 FET. However, the Peluso P67 is probably the closest direct match I can think of, in terms of being based around a K67–style capsule and using a similar 6ZH1P pentode valve. The Peluso’s physical styling is closer to the U67’s classic shape, rather than the stylish bottle style of the SU–017, though, but the price is substantially lower at around £1699 in the UK. The Pearlman TMLE and Mohave Audio MA–200 are also claimed to be homages to the Neumann U67. Warm and full–bodied sound character with a sense of airiness, too. Hand–built with pride and care. A visually attractive valve mic with a rich sound character to match. Hand–built entirely in Russia, with a capsule design based on the classic Neumann K67.